Since 1994, Peppers Eyewear has worked closely with designers and factories to produce an innovative line of sports and lifestyle sunglasses. Using influences from the top trends from around the world, we bring our customers the most current fashions as well as construction materials and designs. 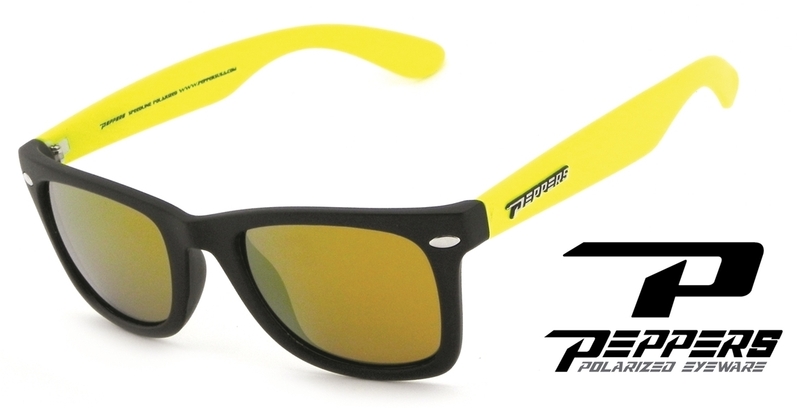 Each pair of Peppers sunglasses comes backed by our lifetime warranty. We want you to focus on having fun in the sun, instead of worrying about small accidents that may happen along the way. In 2012 Peppers received an REI top vendor award. CONDITION: Brand new with Lifetime Warranty included. LENS COLOR: Diamond Gold Mirror. SIZE: Lens width 50mm/earpiece length 144mm/bridge 22mm. These are mens small to mid-sized sunglasses.